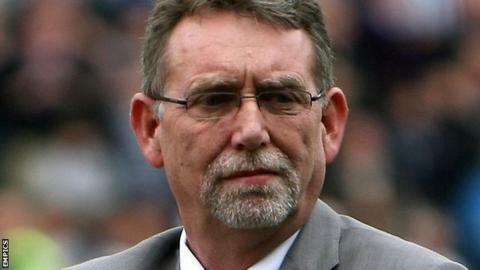 Owner Ray Trew is interested in selling Notts County to local businessman Alan Hardy, reports BBC Radio Nottingham. Trew announced on Thursday that he was stepping down as chairman of the League Two side and says he is looking to sell the club after his family were subjected to "foul and mindless abuse". Trew and Hardy have been in contact for a few weeks but a deal is not imminent. Both parties are understood to be a long way from agreeing a value for the club, which Trew has owned since February 2010. Notts chief executive Julian Winter told BBC Radio Nottingham: "There is interest [in buying the club] and Ray's talking to certain people." The Magpies are 16th in League Two having been relegated last season, and appointed Jamie Fullarton as manager in January following the sacking of Ricardo Moniz.